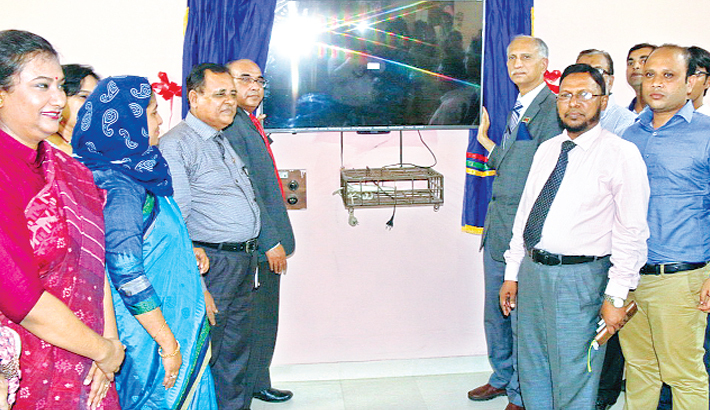 Syed Abu Asad, Deputy Managing Director of Sonali Bank Limited, hands over a television set to Dr. AAMS Arefin Siddiqui, Vice Chancellor of Dhaka University for recreation of the students of Nawab Faizunnesa Chowdhurani Mohila Hostel, at a ceremony on the hostel premises on Wednesday. Alhajj Hafez Md. Enayet Ullah, Chairman of the Executive Committee of Al-Arafah Islami Bank Limited, presides over the 551th EC meeting of the bank, at the bank’s head office in the city on Thursday. The EC meeting reviewed overall business performance of the bank. Monzur Hossain, Chairman of Rupali Bank Limited, hands over a certificate to a participant of a training workshop titled “Dedication to be a Promising Banker,” organised by the bank at Rupali Bank Training Academy in Dhaka recently. Md. Nazrul Islam, General Manager & Principal of RBTA was present. New Reserve Bank of Australia Governor Philip Lowe (C) speaks at a parliamentary economics committee hearing flanked by new Deputy Governor Guy Debelle (R) and the Assistant Governor Christopher Kent (L) in Sydney on Thursday. Lowe said the central bank were not "nutters" about keeping inflation in a tight range, and are instead maintaining a flexible approach as Australia, like other economies, battles low inflation amid subdued oil prices and tepid global trade. Federal Reserve Chair Janet Yellen speaks during a press conference following the announcement that the Fed will leave rates unchanged, in Washington, DC, Wednesday. The Federal Reserve kept its benchmark interest rate unchanged for the sixth straight meeting Wednesday, saying it needs to see more signs of strength in the US economy. ASM Bulbul, Deputy Managing Director and CAMLCO of National Bank limited (NBL) and Md. Serajul Islam, CEO, Info Tech Limited, exchange documents after signing an agreement at the head office of NBL in the city on Wednesday. Ali Reza Iftekhar, Managing Director and CEO of Eastern Bank Limited (EBL), hands over a bouquet to Abu Hena Mohd. Razee Hassan, Deputy Governor of Bangladesh Bank, for his role in earning recognition by Bangladesh for its actions against money laundering and terrorism financing in the category of 'international standards' from the APG ( Asia/Pacific Group on Money Laundering) in the city on Thursday. Members of Bangladesh Financial Intelligence Unit (BFIU) and senior management of EBL were also present on the occasion.